The proper tungsten material to use for an application depends on many variables, including the type of weld, the composition of the material being welded, the amperage level, among other factors. The following section discusses available options and highlights the accepted standards. The recommendations provided are based on information from industry end users and tungsten manufacturers. However, because of the many variables present in the welding process, it is difficult to generalize. The best way to determine which tungsten material is best suited for a particular application is through testing. Diameters and Lengths: Tungsten Electrodes are available in a variety of standard diameters and lengths. The most commonly used diameters are shown in Table 2. In addition to these sizes, some manufacturers also offer .020” (0.5mm) and ¼” (6.4 mm) tungsten. The most common length is 7.00” (175 mm). Tungsten is normally sold in boxes of 10 pieces. Current Ranges: Refer to Table A.2 of AWS A5.12M/A5.12:2009 Specification for Tungsten and Oxide Dispersed Tungsten Electrodes for Arc Welding and Cutting. The American Welding Society document provides a table that shows the general current ranges for tungsten using Direct Current (DC) and Alternating Current (AC). All values listed are based on using argon as the shielding gas. Different electrode materials will vary slightly from these guidelines. Use of other gases will also change the recommended currents. As such, this chart should be used as a general guide. Also keep in mind that for a given amount of amperage, larger diameter electrodes will last longer, but will be harder to arc start. Excessive current will cause the electrode to melt and drop off. Insufficient current will lead to unstable arc. International Colour Coding Chart: Each stick of tungsten has a color code applied to one end which identifies the material type of the tungsten. Refer to Table 1 of AWS A5.12M/A5.12:2009 Specification for Tungsten and Oxide Dispersed Tungsten Electrodes for Arc Welding and Cutting. The American Welding Society document provides a table that identifies the color coding used in United States, Europe, and Japan, which represent the bulk of the market share of sold tungsten. In most applications, welders use tungsten that contains an emission-enhancing oxide such as Thorium, Cerium, or Lanthanum. These oxides naturally migrate from inside the tungsten to the heat at the point of the electrode, where they give off their oxide element in the arc, and leave a film of the metal alloy on the tip. This causes the electrode to have a different temperature at the tip based on the work function of that element. The oxides that are emitted at the tip serve to improve arc starting and stability. They also cause the electrode to provide the same level emission as pure tungsten at much lower temperatures. Lower temperatures improve the longevity of the tungsten and keep the grains within the tungsten smaller for improved arc stability. Thus, oxides are a very important part of tungsten. Each oxide has unique physical characteristics that affect tungsten performance. In addition, the technique used in manufacturing the tungsten will also affect its performance. tungsten performance quality that is produced by the different manufacturers. During the extreme temperatures of welding, the grains have a tendency to combine with larger neighboring grains to form one large grain in a process called “grain growth.” However, if a continuous flow of oxides at the grain boundaries is maintained, this serves to surround the grains and keep them from combining. Thus, oxides are grain growth inhibitors. When tungsten runs out of oxides in any area, the grains combine readily, and the tungsten performs poorly because the oxides lack avenues to move to the surface. In Figure 1 the 2% Lanthanated electrode still has a very small grain structure even after one hour of welding time at 180 amps on a 1/16” electrode. This condition is the result of quality manufacturing and the oxide properties of 2% Lanthanated tungsten. Oxide Distribution and Size: Oxide distribution is a key indicator of quality. Oxides should be distributed homogenously throughout the tungsten. Uneven distribution results in poor performance: areas with little or no oxides will tend to suffer from grain growth, whereas areas with too much oxide will tend to “bottleneck” and prevent the oxides from getting to the point. Higher quality oxides are smaller in size, which allows them to migrate to the tip easier. Electron Work Function (eV): Work function is the energy needed to remove an electron from an atom, and it is measured in electron volts (eV). The lower the work function of an electrode, the lower the voltage necessary to strike an arc, thus the easier the arc starts. The oxides added to a tungsten serve to promote the electron emission by lowering the work function of the tungsten. Table 4 lists different oxides and metals and their respective work functions. The lower the eV for the oxide, the easier it will start. The metal work function is important, because upon emitting an oxide, the metal is left as a film on the tip. The lower the eV of the metal at the tip, the lower the temperature will be at the tip which will decrease grain growth and provide a constant flow of oxides and longer service life. The more of an oxide added to tungsten, the lower the work function that tungsten will have, and thus the better it will arc start. A 2% Lanthanated tungsten will arc start more easily than a 1% Lanthanated tungsten (assuming they were made using the same manufacturing process). Note: It is difficult to compare different types of electrodes without testing because of the different properties of the oxides. Density: Each oxide has a different density. Thus a 2% by weight thorium, cerium, or lanthanum electrode will all have different amounts of oxides by volume. Table 5 describes the difference between density and weight for different materials. Although each material has 2% by weight of the oxides, a 2% Lanthanated tungsten has a significantly higher volume of oxides than 2% Thoriated tungsten to feed to the tip. Note: Even if electrodes are the same type, electrodes of different manufacturers cannot be compared using only the work function and volume of oxides, because this comparison would not take into account the important manufacturing variables such as grain size and structure of the oxide size and distribution. Therefore, the work function and oxide density numbers should only be used as a general guide. Testing is always the best way to determine which tungsten will be best for you. Migration and Evaporation Rates: The migration rate, or diffusion rate as it is often called, is the rate at which each of the different oxides naturally travels from inside the tungsten to the heat at the tip of the electrode. The evaporation rate is the rate at which the oxides separate from their metal component and are emitted at the tip of the electrode. The optimum-performing electrode is one that has a balance of good migration and evaporation rates. If the migration rate is slower than the evaporation rate, then there will be an inadequate amount of oxides arriving at the tip to maintain a consistent arc and the tungsten may be reduced to the performance level of pure tungsten. If the evaporation rate is slower than the migration rate, the oxides will be crowded at the point. If both of the rates are very high, welding properties at the beginning of welding will be great, but all of the oxides may be used up quickly. The following provides a description of the general characteristics of common oxide types. Keep in mind that testing is the only way to determine which tungsten is optimal for a particular application. Thoriated tungsten contains thorium oxide (THO2 or thoria), and it is the most commonly used tungsten in America. It has become the standard for comparison. However, because it is a low-level radioactive hazard, many users have switched to other alternatives. 2% Thoriated tungsten is a good general use tungsten. It has one of the lowest work functions, and it performs well when overloaded with extra amperage. However, it does not hold its point as well as some other non-radioactive tungstens that have been introduced. Two types of Thoriated tungsten electrodes are available. The EWTh-1 and EWTh-2 electrodes contain 1 percent and 2 percent, respectively, evenly dispersed through their entire lengths. Thoriated tungsten electrodes are superior to pure tungsten electrodes in several respects. The thoria provides about 20 percent higher current-carrying capacity, generally longer life, and greater resistance to contamination of the weld. With these electrodes, arc starting is easier, and the arc is more stable than with pure tungsten or Zirconiated tungsten electrodes. The EWTh-1 and EWTh-2 electrodes were designed for DCEN applications. They maintain a sharpened tip configuration during welding, which is desirable for welding steel. They are not often used with AC because it is difficult to maintain the balled end, which is necessary with AC welding, without splitting the electrode. responsibility. Europe has discussed eliminating the use of thorium altogether because of these problems. Welders should obtain current information on the subject for a complete understanding. Ceriated tungsten was introduced into the United States in the early 1980s as the first non-radioactive alternative to Thoriated tungsten. It is most commonly offered as 2% Ceriated tungsten, and it is readily available. The EWCe-2 electrodes are tungsten electrodes containing 2 percent cerium oxide (CEO2), referred to as ceria. It is known to be especially good for DC welding with low amperage because it starts very easily at low amps and usually requires about 10% less amps than Thoriated material to operate. Thus it is the most popular material used for orbital tube and pipe welding, and it is also commonly used for welding very small parts. Compared with pure tungsten, the Ceriated electrodes exhibit a reduced rate of vaporization or burn-off. These advantages of ceria improve with increased ceria content. Cerium also has the highest migration rate so it gives it good welding properties at the beginning, but it has a significantly reduced migration rate over time due to grain growth. However, at lower amperages it should last longer than Thoriated tungsten. Because of these properties, it is generally good for short welding cycles or when a specific number of welds are called for and then the electrode is to be replaced. Higher amperage applications are best left to Thoriated or Lanthanated material. EWCe-2 electrodes will operate successfully with AC or DC, however, it is used primarily for DC welding as it may split if used for AC welding. The most common Lanthanated tungsten contains 2 percent lanthanum oxide (La203), referred to as lanthana. In Europe and Japan, Lanthanated tungsten has been the most popular alternative to 2% Thoriated tungsten for most applications. It is available as 2%, 1.5%, and 1% Lanthanated tungsten. Lanthanum Trioxide has the lowest work function of any if the materials thus it usually starts easiest and has the lowest temperature at the tip, which resists grain growth and promotes longer service life. Testing of 2% Lanthanated material has shown that it offers a much longer life than Thoriated if not overloaded and better arc starting in most applications. It is also especially good at (a) resisting the “Thermal shock” of pulsing, (b) working in welding in situations where there are numerous re-ignitions with a short weld cycle, and (c) resisting contamination. Welders with tube mill applications have been especially satisfied with this material because its longer life reduces down time. Also, as a general rule it will probably require about 15% less amps to start and sustain low current arcs. The Lanthanum in this tungsten is a “rare earth” material and is not radioactive. It has not been as heavily marketed and used in the United States as in Europe or Japan, however Diamond Ground Products, Ltd. has been offering this material since 1993. This tungsten is primarily used for DC welding, but will also show good results for AC welding. 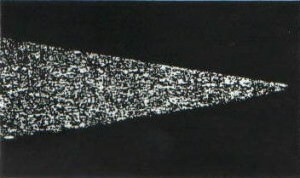 The EWLa-1 electrodes were developed around the same time as the Ceriated electrodes and for the same reason, that lanthanum is not radioactive. These electrodes contain 2 percent lanthanum oxide (La203). more difficult to start and produce a stable arc than other materials. Also, because of the high work function, the temperature at the tip is higher and grain growth occurs. This leads to an unstable arc, starting difficulty, and a shorter service life. Pure tungsten is only used for AC welding; however; better alternatives are available. Easier starting compared to 2% Thoriated tungsten. A much longer tip life compared to non-treated 2% Thoriated tungsten electrodes. More consistent welds as a result of crisp starts. Longer overall electrode life when compared to a 2% Thoriated tungsten. Higher amperage tolerance as compared to a 2% Thoriated tungsten. Cryo-T is recommended for all current users of 2% Thoriated tungsten. Selecting the correct electrode for specific applications must take into account the different current levels and power supplies. Current levels that are in excess of those recommended for a given electrode size and tip configuration will cause the tungsten to erode or melt. Tungsten particles may fall into the weld pool and become defects in the weld joint. Current levels that are too low for a specific electrode diameter can cause arc instability. Direct current with the electrode positive requires a much larger diameter to support a given level of current, because the tip is not cooled by the evaporation of electrons but heated by their impact. In general, a given electrode diameter on DCEP would be expected to handle only 10 percent of the current possible with the electrode negative. With alternating current, the tip is cooled during the electrode negative cycle and heated when positive. Therefore, the current carrying capacity of an electrode on AC is between that of DCEN and DCEP. In general, it is about 50 percent less than that of DCEN. Testing is the best way to determine which tungsten material is best for a particular application and/or which manufacturer produces a high quality tungsten. Document the following properties of the different tungsten when testing in order to compare products. Utilizing materials that last longer and improve arc starting can lower costs and improve the welding process. In addition, reduced down time in replacing and preparing new electrodes is a substantial savings to consider.